The_Times_news | Eczema And Stress: What’s The Connection? Eczema And Stress: What’s The Connection? Stress is one of the most common triggers of eczema. Eczema may be difficult to completely get rid of since it often runs in families. Taking steps to reduce stress, like exercising daily, practicing meditation, and getting enough sleep can reduce the likelihood of an eczema outbreak. Atopic dermatitis, more commonly known as eczema, can be a bothersome condition, especially due to the many triggers that can cause an outbreak of red, itchy rashes. Dry weather, household chemicals in shampoo or body wash, and allergens in the air can all cause eczema to flare up. Stress, one of the most common eczema triggers, can be much more difficult to manage because you may not even realize that you’re stressed or are unable to regulate the source of the stress. This is especially true when it’s caused by work, family, or other everyday situations that feel out of your control. But understanding the cause of your stress and how it’s related to your eczema can help you learn how to manage it and keep it from causing outbreaks. Eczema can have several root causes. In some people, eczema stems from a genetic mutation that affects your body’s ability to make a skin protein called filaggrin. Without enough of this protein, your skin can get dry easily. This makes you more susceptible to skin irritation and outbreaks. You can also get eczema from allergic reactions. Outbreaks of eczema, as is the case with other skin conditions, can be triggered by stress. Stress causes a spike in the hormone cortisol (sometimes called the stress hormone). When your body produces high amounts of cortisol because of stress, your skin can become abnormally oily. This can then trigger an eczema outbreak. One study also suggests that stress makes it harder for your skin to recover from irritation and skin damage. 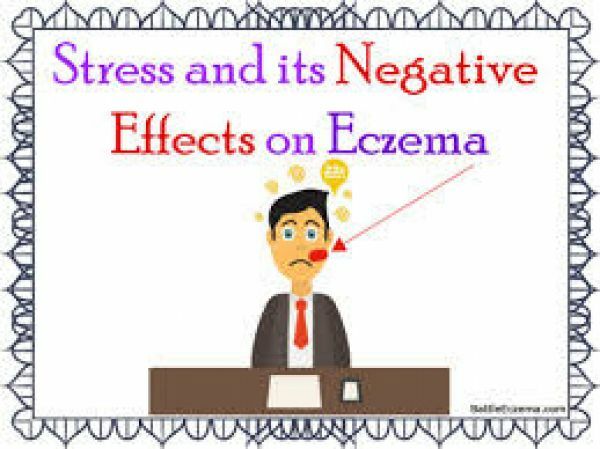 Not only does stress cause eczema, it can make eczema outbreaks last longer and make you feel more stressed as a result. This can lead to a seemingly endless cycle. Another study showed that stress during pregnancy can cause infants to be at risk for eczema outbreaks. This study looked at the pregnancies of nearly 900 mothers and their children and found that women with higher levels of anxiety during their pregnancies increased their children’s chances of having eczema when they were between 6 and 8 months old. Because eczema can be caused by allergic reactions, being exposed to pollution or other toxins in the air as well as chemicals in everyday products can trigger an eczema breakout. Pollen, cat and dog dander, and mold can all trigger a breakout. Food allergies, such as to wheat, eggs, or dairy products, can also trigger breakouts. Using a shampoo, conditioner, or body wash with certain chemicals can also trigger a breakout. If you can pinpoint the environmental trigger of your breakouts, try to avoid those chemicals or allergens and use different cosmetics products to limit your exposure. Because raised levels of stress can trigger eczema, some people feel the urge to smoke a cigarette or use another tobacco product to reduce stress. But smoking can make your eczema breakouts worse (not to mention all of the other negative health effects). One study suggested that smoking 10 or more cigarettes a day makes you more susceptible to breakouts. If you’ve noticed that stress causes you to have breakouts, avoid smoking so that your breakouts aren’t as severe. Studies show that even smoking hookah (sometimes called nargile or water pipes) can trigger your eczema. Is it more than just stress? Some research shows that having anxiety is a constant trigger of eczema outbreaks. Unlike stress, anxiety can be hard to control without medication. One study suggested that having anxiety can cause somatization, in which you experience physical symptoms. An eczema outbreak is one possible type of somatization due to anxiety. Talk to your doctor if you have constant eczema outbreaks even when you’re not feeling stressed. If you have a family history of both eczema and anxiety or depression, you may need to address these underlying issues before you can get your eczema under control. There are many preventive measures you can take to avoid eczema breakouts. Exercise for half an hour every day or so. This might include jogging, lifting weights, or other light activities. Set long-term goals so that you can gradually work fitness goals into your routine. Meditate for 10 minutes or more a day. Spend time with family or good friends regularly. Get at least seven to eight hours of sleep every night. Go to an allergist and get tested for allergens that may be triggering your eczema. Once you learn what you’re allergic to, try to avoid exposure to these allergens as much as possible. Use moisturizer at least twice a day (such as Jergens, Eucerin, or Cetaphil) to keep your skin moist and less susceptible to dryness and irritation. Using baby oil on moist skin (after a bath or shower) is also effective. Take short baths or showers (10-15 minutes) in warm water. Hot water can cause your skin to dry out more easily. Use bath oils when possible to keep your skin moist. Use mild body wash or soap to avoid excessive chemical exposure and drying out of your skin. After a bath or shower, use a clean towel to smoothly and gradually dry your skin, or wipe water off quickly with your hands. Use moisturizer quickly while your skin is still moist. Wear clothing that allows your skin to breathe and that doesn’t rub against your skin, which can cause irritation. Avoid materials such as wool. Your doctor may prescribe you a corticosteroid or a topical calcineurin inhibitor (known as a TCI) to help relieve eczema rashes and their symptoms, such as itching and redness. Some home treatments, such as coconut oil, can also help relieve eczema symptoms and prevent further outbreaks by moisturizing your skin. Eczema can be difficult to avoid entirely because it can be passed down in families and triggered by factors beyond your control, especially allergens and other invisible environmental causes. But there’s plenty you can do to keep your number of outbreaks to a minimum and to keep the length of an outbreak short and as comfortable as possible. Many lifestyle changes and treatments, such as moisturizers, fitness routines, and meeting with others who also have eczema may help you not only manage your eczema but also cope with it in a healthy, positive way. With your eczema under control, you can reduce the stress that causes you to have outbreaks and also minimize the stress that results from eczema. Web Title : Eczema And Stress: What’s The Connection?